Crowley E, Harrison AJ, Lyons M. The Impact of Resistance Training on Swimming Performance: A Systematic Review. Sports Med. 2017 May 12. If looking for a program for your team, checkout Dryland for Swimmers. First off, should all swimmers do resistance training? 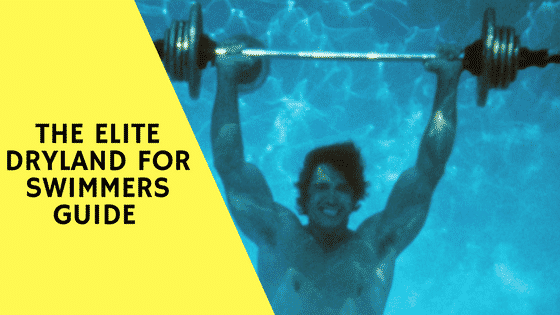 I believe that every athlete should be practicing some form of resistance training, especially swimmers, even if it is only for 10 – 15 minutes before each workout. We know from the current literature that swimmers, compared to other athletic populations, have a high prevalence of shoulder injuries, as well as lower back and neck injuries (4). This is primarily due to the high demand on the swimmer’s internal rotators, that results in swimmers having rounded shoulders. This has a knock-on effect and creates a weak lumbar spine and ultimately lordosis of the lower back. Resistance training for swimmers does not need to be in the form of traditional resistance training, especially for younger and low trainability swimmers. Dry-land warm ups provide an invaluable opportunity to introduce functional movements that will aid swimmers in reducing injury risk, improve posture and activation for the workout ahead. It is important to remember that as a strength and conditioning coach our primary role is to give swimmers every opportunity to train week in week out. Therefore, swimmers should participate in a resistance training programme each week. Do you think the traditional circuit training, running, and core are adequate for proper resistance training for swimmers? I most certainly think circuit training and especially core training have a vital role to play in resistance training programmes for swimmers. Circuit training should be the progression for swimmers who can perform basic functional exercises proficiently. The pressure due to time constraints because of the nature of circuit training can cause athletes to be careless and inefficient with regards the quality of resistance exercises being performed, especially when additional weight is added. Therefore, when prescribing circuit training workouts, technique is king. On the other hand, circuit training provides a metabolic challenge for swimmers and ultimately a metabolic adaptation by improving muscular endurance. The strength and conditioning coach needs to be clear with his/her aims when prescribing circuit training as swimmers who perform sufficient volume and intensity in the pool will probably benefit from a more traditional resistance training programme where the primary aim is to increase strength, power and stability. A nice study by Weston et al. (3) showed that core training can have a positive influence on swimming performance. It is important to note that water is a extremely dynamic and unstable environment therefore improving trunk stability and strength is important. Due to the cross-body actions performed in the water, resistance exercises such as supermans, deadbugs, planks (opposite arms, opposite legs), etc., are an important inclusion in any resistance training programme. Running programmes for swimmers need to be monitored with caution. Swimmers with poor gait cycles will expose themselves to a higher risk of injury due to the elevated forces that will perturb the body. Swimmers are renowned for having poor technique when it comes to running and I have heard of many running related injuries. Of course, there are also the swimmers that run regularly during the early parts of the season and during periods of heavy training to provide extra cardiovascular adaptions. Females are sometimes prescribed running programmes due to carrying additional fat free mass compared to male swimmers. Ultimately, I think this all comes back to an individualised training programme and I will touch on this later. You mention in your study: “specific, low-volume, high-velocity/force resistance-training programmes are optimal”. Could you explain this in more detail, because many think low-volume as 20 repetitions. When we talk about specificity there are two world renowned authors that come to mind. Firstly, Bondarchuk (1) who wrote extensively on transfer, which goes hand in hand with specificity. The term transfer refers to the conversion of resistance training exercises to swimming performance. Transfer, along with injury prevention, is the primary goal of the strength and conditioning coach. In order to optimise transfer, specificity of exercise selection is crucial. Verkhoshansky (2) developed the dynamic correspondence theory which discusses the selection and prescription of resistance training exercises. A more swimming specific and simplistic breakdown of Verkhoshansky’s theory can be seen in my latest publication (The Impact of Resistance Training on Swimming Performance: A Systematic Review). My current PhD research will attempt to answer this question. Within the discussion of this systematic review, an example of low volume resistance training was stated. Low repetition ranges (1-6 reps), with a low number of sets (≤ 3 sets) and the prescription of 1-5 resistance exercises. Low-volume for one athlete could be high volume for another, with this also being event specific. The shorter and faster the event the greater the volume of intensity in the weights room compared to the longer events. This is due to the limited number of strokes being performed and therefore the need to optimize each stroke. Not all athletes will follow this trend, as some distance swimmers will carry out high volume gym programmes but this is usually female athletes. It is important to note that in elite sport there will always be an athlete that goes against the common trend, this is why elite sport is so enthralling! The reason for low volume resistance training is explained extensively in the review but primarily has to do with increasing maximum strength and neuromuscular adaptations with reduced fatigue. Therefore, giving the swimmer the best opportunity to perform at optimally in the swimming pool. With regards intensity, the greatest effects on swimming performance were seen when exercises were performed at maximal force or velocity, therefore allowing for optimal neuromuscular adaptations to occur. This has been seen across a number of studies referring to sports performance but in order to keep intensity levels high, volume needs to be relatively low and large rest periods are needed. How would a proper resistance training program differ between a sprinter and distance swimmer? Sprinters will spend considerably more time in the weights room than distance swimmers, with 50 and 100 m swimmers spending much more time than the 100 and 200 m swimmers. This is due to the greater importance of the aerobic system as event duration increases. Sprinters will focus on increasing peak strength and power values across a variety of lifts. Lower body strength has been seen as a significant indicator of 15 m time due swimming starts requiring high levels of power and strength. Therefore, squat and deadlift variations are important while focusing on both ends of the force velocity curve in a structured manner. Upper body strength has shown positive results with regards to sprint performance, with specificity being important. My PhD programme will focus on the specificity of upper body resistance training exercises to swimming performance, more specifically swimming velocity. Distance athletes don’t need to spend excessive amounts of time in the weights room, with their primary goal being injury prevention and posture. Therefore, monitoring volume is important to not effect swimming workouts. The resistance programme should focus on protecting the swimmer’s shoulders with a peak strength and power element. For distance swimmers, the resistance training programme becomes subjective compared to the sprinter who will target to become stronger or maintain personal best’s each session. The distance swimmer should still lift heavy but within a controlled programme. An individualised approach is necessary in each case, depending on the demands of the swimming programme. I believe that within the programme resistance exercises included should provide; specificity to swimming and primary discipline (squats, pull ups, etc. ), injury prevention, mobility, plyometrics (hops, CMJ, squat jumps, etc. (slow progression here is essential)), core stability (plank variations, v-sit ups, etc) and functional movements (bear crawls, handstands, etc. ), all exercises should be performed as close to a swimming specific position as possible. It is important to note that plyometrics need to be prescribed with caution but when executed properly will provide additional benefits to starts and turns. Plyometrics will also improve leg kick as the improvement in eccentric strength will help the swimmer hold more water on the down beat of the kick in freestyle, backcrawl and butterfly. It will also create an elastic affect for the breaststroke kick. How would a proper resistance training program differ between a free, back, breast, and fly swimmer? I think stroke specific resistance training programmes should only be introduced once the swimmer has mastered the core lifts and has a mature level of trainability. We can couple the strokes, freestyle and backcrawl (rotational strokes) and butterfly and breaststroke. Rotational exercises are best performed with medicine balls, such as woodchoppers or rugby pass throws. The fact that freestyle is performed in the supine position and backcrawl in the prone position, this will require specific core control and stability exercises. Butterfly has a good crossover to freestyle but requires extensive hip strength, stability and lumbar mobility. Breaststroke is quite unique compared to the other strokes but mimics the pull phase of the butterfly arms and requires similar hip stability and strength. Leg strength in breaststroke accounts for up to 70 % of propulsive forces and therefore the resistance training programme is to be tailored to these demands. It is important to note that a balance between swimming and gym needs to be found for breaststrokers as lower body demands are very high in the pool compared to the other strokes. In saying this, breaststrokers tend to spend more time than other swimmers in the gym due to the strength level required to execute the stroke at an elite level. On a side note, I am not a huge fan of Olympic lifts as it requires a significant amount of time to master the lift and time in the gym is very limited for swimmers. I’ve seen very poor technique, too many times! I believe using the derivatives of these lifts are useful, especially for incorporating multi joint movements within the resistance training programme. How should coaches balance on land resistance training and in-water resistance training? On land exercises should be conducted three times weekly, with in water resistance training being conducted throughout the week. Sprinters will designate sessions to in water resisted swims with distance swimmers using it as a technique or feel tool, usually. We know that resisted swims can aid at increasing stroke rate over a period of time with stroke rate being a key determinant in sprinting performance. Therefore, sprinters will incorporate this into their programme up to twice weekly. It is important not to over use tools such as resisted bands as they will alter body position in the water as well as affect the swimmers feel for the water. They often use the rack or buckets to provide a post activation potentiation stimulus, which is quite individual and works for some athletes. Distance athletes would often be renowned for having the ability to swim faster using hand paddles or pull buoy and hand paddles. Hand paddles often result in the swimmer dropping his/her elbow because of the hand paddles catching such a large volume of water compared to no hand paddles. This can alter stroke mechanics when the hand paddle stimulus is removed. This needs to be prescribed with caution. Do you think swimmers should do on land resistance training before or after swimming? I think dry-land warm ups are very important and should be incorporated before every session. In the programme I work at in Ireland, National Centre Limerick, we have incorporated a robust preparation programme. This programme includes skipping, arm and leg swings, injury prevention work, mobility work and individual work. We will often incorporate medicine ball work before targeted training sessions. Targeted resistance training programmes that I have worked in have always carried out resistance training sessions post morning workouts. This is down to convenience as the swimmers have school or college and we can’t fit it in anywhere else. In saying this no swimmers within the programme are sprinters or swimmers with a high focus on strength and power development rather whole body stability, control and co-ordination to create a robust and athletic swimmer. The research shows that resistance training should be performed 3 hours’ post swimming training, preferably a low intensity swimming workout, in order to allow for any molecular interference to pass. This should be optimally carried out in the morning to allow for adaptations to occur, as elevated molecular signals will drop if high intensity swimming training is conducted up to 24 hours’ post. What are the most common areas that require improvement in swimming resistance training programs? Monitor training load, better under cooked than over cooked! Working closely with the swimming coach will inform the strength and conditioning coach greatly. Mastery of functional resistance training exercises is vital in order to optimise transfer. Keep it simple, don’t over complicate. Remember they’re swimmers, not gym junkies! Trying to make a swimmer in the gym, won’t happen! Swimmers become fast from swimming fast and using resistance training as an additional tool. Resistance training is an accessory tool. Poor mobility and co-ordination is very evident across the swimming population and deserves attention, more important than getting stronger at bench press or squats. Having the ability to get into strong swimming positions is vital. Bondarchuk A and Yessis M. Transfer of Training in Sports II.Ultimate Athlete Concepts, 2010. Verkhoshansky Y and Siff MC. Supertraining.Verkhoshansky, 2009. Weston M, Hibbs AE, and Thompson KG. Isolated core training improves sprint performance in national-level junior swimmers. Int J Sports Physiol Perform.10, 2015. Wolf BR, Ebinger AE, Lawler MP, and Britton CL. Injury patterns in Division I collegiate swimming. American J Sports Med.37: 2037-2042, 2009.